Hi there! Today I tell you on 3 irregular satellites of Jupiter, you know, these small bodies which orbit very far from the planet. Himalia, Elara and Carme have been observed in the Near-InfraRed (NIR), and this gave Composition of Jupiter irregular satellites sheds light on their origin, by M. Bhatt et al., which has been recently accepted for publication in Astronomy and Astrophysics. The irregular satellites, which orbit very far from Jupiter. These are small bodies as well, which are usually thought to have been captured, i.e. they probably not formed in the protojovian nebula. Contrary to the inner and the Galilean satellites, the irregular satellites have pretty eccentric and inclined orbits. Their eccentricities may exceed 0.4, and most of them are retrograde, i.e. with an inclination larger than 90°. In fact, plotting their inclination vs. their semimajor axes reveals clustering. 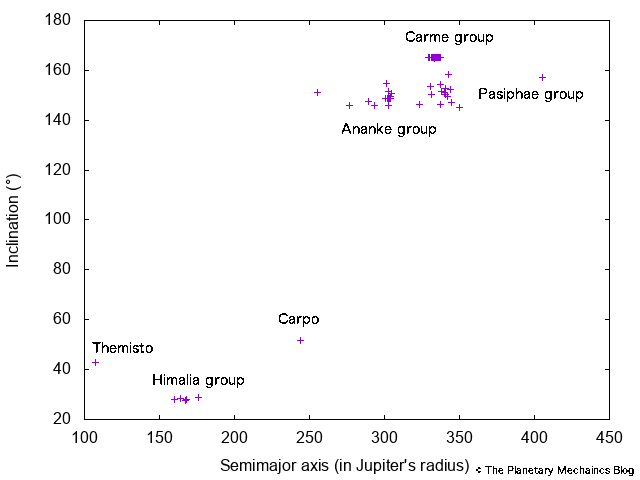 Semimajor axes and inclinations of the irregular satellites of Jupiter. The inclinations are given with respect to the ecliptic. The clustering among these bodies suggests a common origin, i.e. a group of objects would have a unique progenitor. It is also interesting to notice that some groups are more dispersed than others. In particular, the dispersion of the Carme group is very limited. This could tell us something on the date of the disruption of the progenitor. Another clue regarding a common origin is the composition of these bodies. Before addressing our 3 objects of interest, i.e. Himalia, Elara (member of the Himalia group), and Carme, I would like to mention Themisto and Carpo, which seem to be pretty isolated, and so would not share a common origin with the other bodies. Their dynamics might be affected by the Kozai-Lidov mechanism, which induces a correlated periodic evolution of their eccentrities and inclinations. These 3 bodies are the ones addressed in this study. You can find below their relevant characteristics. These were among the first known irregular moons of Jupiter. The inclinations are given with respect to the ecliptic, i.e. the orbital plane of the Earth. As a member of the Himalia group, Elara has similar dynamical properties with Himalia. We can also notice the small albedo of these bodies, i.e. of the order of 4%, which means that only 4% of the incident Solar light is reflected by the surface! In other words, these bodies are very dark, which itself suggests a carbonaceous composition. Spectroscopic observations permit to be more accurate. These bodies were observed in the near infrared, at wavelengths between 0.8 and 5.5 μm. The observations were made at the IRTF (InfraRed Telescope Facility), located on the Mauna Kea (Hawai’i), with the SpeX spectrograph, during 4 nights, in 2012 and 2013. In measuring the light flux over a specific range of the spectrum, one can infer the presence of some material, which would absorb the light at a given wavelength. For that, we need to be accurate in the measurements, while the atmospheric conditions might alter them. This difficulty is by-passed by the presence of a star in the field, which serves as a reference for the measured light flux. Once a spectrum reflectance vs. wavelength is obtained, it needs to be interpreted. In this study, the authors assumed that the observed spectra were a mixture of the spectra given by different minerals, which have been obtained in laboratories. They disposed of a database of 30 minerals, and fitted mixtures involving 4 of them, to the obtained spectra. This is an optimization algorithm, here named Spectral Mixture Analysis, which fits the relative proportion of the minerals. 4 minerals is actually the best they could obtain, i.e. they failed to produce a significantly better fit in adding a 5th mineral. In other words, from the absorption spectrum of such a body, you can guess its 4 main components… at least of the surface. Well, the title contains the conclusion. This is not very surprising, since Himalia and Elara belong to the same group. We can say that the composition confirms the guess that they should have a common origin. Previous studies gave the same conclusions. In this specific case, Himalia and Elara have a peak of absorption centered around 1.2 μm, and their spectra are similar to C-type, i.e. carbonaceous, asteroids (52) Europa and (24) Themis, of the outer asteroid belt. The best match for Himalia is obtained with a mixture of magnetite and ilmenite, both being iron oxides, with minnesotaite, which is a ferric phyllosilicate. Elara seems to have a similar composition, but the match is not that good. In particular, the spectrum is more dispersed than for Himalia, and a little redder. Carme has a different spectrum, with a peak of absorption centered around 1.6 μm, and is probably composed of black carbon, minnesotaite, and ilmenite. Another study has proposed that Carme could have a low-level cometary activity, but that would require to observe it at shorter wavelengths. Out of the scope of this study. and the ResearchGate profile of Paul Mann.